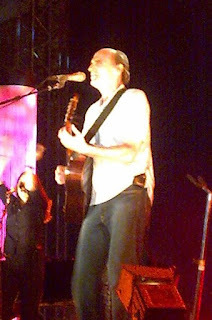 The highlight for me was seeing James Taylor in concert at the Lucca Summer Festival. James Taylor is my long-time favourite artist (though his son Ben Taylor is a firm second). We were driving on our way to the villa when I saw a billboard advertising the festival and JT's appearance. I've already seen him five times but still, once more would be a charm, especially in the open air of a warm summer evening in Lucca's Piazza Napoleone, wouldn't it? My husband has also seen JT a few times. Reluctantly. Trouble is, he is a Blur and Billy Bragg man and only comes along to keep me company and prevent me from making an idiot of myself by rushing the stage or doing something else a 40-something woman shouldn't be doing at a concert by a 62 year old legendary former drug-addict. I looked at my husband appealingly. Would you like to go? he asked, through gritted teeth. No, I replied, it's okay (e yes downcast). A couple of days later we are in possession of tickets five rows from the front. (Courtesy of Luca's Euros as the credit card machine was broken) Whoopee! He's such a good sport, my husband. And there we were just two days after that, me singing along ecstatically, husband clapping politely, insisting he was having a good time (not as good as me, obviously). Luca wanted to go too, but we would have had to sit further back, so hard luck, son. Old String-bean was fan-bloody-tastic, as good as he was when I saw him in 1989 and with the two of the same backing singers to boot. He did the old favourites (well let's face it he's been going since the late sixties) and it really made my holiday memorable. The only downside was that I forgot my camera and had to rely on my camera phone which was a bit rubbish (see pic).